Synthetic non-phosphopeptide derived from human JunD around the phosphorylation site of Serine 255. Breast carcinoma, extracts from Hela cells. Our Abpromise guarantee covers the use of ab28837 in the following tested applications. WB 1/500 - 1/1000. Predicted molecular weight: 35 kDa. Transcription factor binding AP-1 sites. All lanes : extracts from Hela cells. 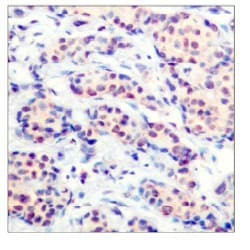 Immunohistochemical analysis of paraffin embedded breast carcinoma, using 1/50 JunD Antibody(ab28837). Publishing research using ab28837? Please let us know so that we can cite the reference in this datasheet. 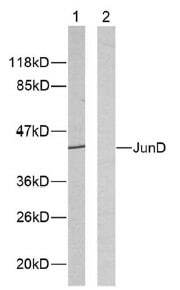 What isoform of p-JunD this antibody can pick up? Jun D comes in 2 isoforms- 37 and 41 KDa. Thank you for your inquiry. Firstly, this antibody is not phospho-specific. It will recognize the total protein. The immunogen is a synthetic non-phosphopeptide derived from human JunD around the phosphorylation site of Serine 255. We got only one band at about 41kD from the WB image. According to the below reference, there are two isoforms of JunD, a full-length isoform containing 341 amino acids (JunD-FL) and a truncated isoform lacking 48 amino acids at the N terminus (ΔJunD). http://www.jbc.org/content/277/33/29710.abstract I'd imagine that this antibody could detect both isoforms due to where the immunogen falls, however we didn't perform any specific tests to see if the antibody will recognize JunD-FL or ΔJunD. I hope this information helps. Please contact us with any other questions. Thank you for contacting us. The antibody was raised against a sequence around Serine 255 of human JunD. It is not a phospho antibody, though, and will bind the protein only if it is NOT phosphorylated at S255. Regarding the 2 isoforms: I checked the UniPort entry for human JunD protein (http://www.uniprot.org/uniprot/P17535) and found only one isoform listed at 35 kDa. It is the same for the mouse protein (http://www.uniprot.org/uniprot/P15066). Therefore, I am not sure how the 2 isoforms differ from each other. But as long as the sequence around S255 is present in both isoforms, the antibody will recognize both. The immunogen peptide is often between 5-15 residues long and would include S255. I hope this information is helpful to you. Please do not hesitate to contact us if you need any more advice or information. Thank you for contacting us. All our product are covered by Abpromise guarantee which states we replace or fully refund products not performing as stated on the datasheet when reported within 6 months of delivery. Please click the following link for full terms and conditions for Abpromise https://www.abcam.com/index.html?pageconfig=abpromise I hope this information is helpful to you. Please do not hesitate to contact us if you need any more advice or information.